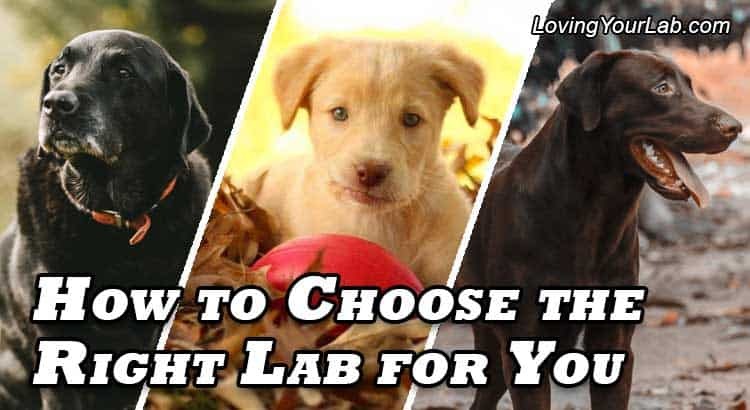 Which Type of Labrador Is Best? What Age Labrador Is Best? Which Color Labrador Is Best? Labradors are sweet, loving dogs. They are also full of energy and crave attention. You need to examine your current lifestyle and consider whether a Labrador is the best fit for you. How busy is your life? Are you willing to take the time to train and play with your new Labrador? Labs need lots of exercise. Are you willing to take your Lab for daily walks and play with him in your yard or at a local park? Your Labrador will be with you for a good chunk of time. You could have him for the next ten years or more. Are you prepared for that commitment? You may have to make changes to your schedule as well as to your home. You will need to have a dedicated space for your Labrador to sleep, eat, and be kept safe when you aren’t home. You may have to remove items that can get him into trouble; things he might chew on or tear up. In order to make the transition as smooth as possible, both for our new Labrador puppy as well as our family, we put in a lot of extra research and took some important steps to ensure that our home was prepared. If you’d like to save yourself some extra time and effort, you’ll want to check out my article, Preparing for Your Labrador Puppy, in which I go over all of the ways that you need to prepare your home and yard for your new addition. If you are sure you are ready for a Lab then you need to decide if you want a puppy or an older dog. Puppies need extra time as they will need to be taught everything. Are you ready to potty train and do everything it takes to have a puppy in your home? I have written a few articles that deal with training your Labrador. Eight Basic Commands Every Labrador Should Know. If you don’t want to have to go through all the training stages then maybe you should consider adopting an older dog. Think about everything you will need to purchase for your new Labrador. For a list of important supplies, see my article Essential Supplies for Your Labrador Puppy. Although this is a list for puppies, you will need most of the same items if you adopt an adult Lab. Also, keep in mind that your Labrador will need regular veterinary care. Make sure you are willing and able to cover the cost of owning a Labrador before you make this decision. Our article How Much do Labs Cost can help you prepare for every expense you need to consider. Owning a Lab is a wonderful, rewarding experience. However, a Lab isn’t the right dog for everyone. Think it through and don’t make a rash decision. It’s so easy to look into those sweet eyes and want to take him home right away, but you’ll be doing yourself and the Lab a favor, by thinking everything through. There are three basic types of Labradors- hunting dogs, show dogs, and companion dogs. If you are looking for a hunting or show dog you will need to do a little more research than if you are just looking for a companion dog. If you want a hunting dog then you should try to find an actual shooting kennel. This kennel would have Labradors that are active hunters. If the Lab is bred from dogs that are hunters it should already have some natural retrieving instincts. Also, if it is living at an active shooting kennel the puppy will already be used to the sounds of gunfire. If you see a dog showing signs of gun shyness then he would not be a good choice for a hunting dog. Good hunting Labs are lively and in good shape, even when they are just puppies. By eight or nine weeks of age, they should eagerly chase after a ball or stick that is thrown nearby. It’s hard to tell for sure if a Lab puppy will be a great hunting dog or not, but if they chase after something to retrieve it and are not afraid of gunfire then you know they are on the right track. If you are looking for a show dog then you will definitely want to purchase from a breeder who has a reputation for breeding winners. Pedigree is very important with show dogs; you need to be certain about the line of labradors it comes from. You will also need to find out if the sire and dam are both award-winning dogs. When purchasing a puppy it’s a little bit of a gamble. Even those that come from the best stock may not be winners themselves. Puppies mature rapidly and there is no way to know for sure at 8-10 weeks old how good of a show dog they will become. If you can wait until the puppy is 4-6 months old the dog will be more physically mature and you can better evaluate the show quality of the puppy. Keep in mind that show-quality Labradors can be quite expensive and often need a different type of care than a hunting or companion dog. If you want a companion dog, one that will just be a good home pet, then you have a lot more options available to you. You can still purchase from a breeder if you wish. This is a good idea if you care about whether the dog is purebred or not and what its lineage is. However, you can also adopt from a shelter or purchase one from a pet store or even someone with a local litter. If you don’t care about the pedigree or if the dog is purebred then you can often get one for a lower price. Our first Lab, Trooper, was adopted from a shelter. He was 6 years old when we adopted him. His physical characteristics and mannerisms match that of a purebred Lab but because we rescued him from a shelter who had no papers on him we can’t be 100% sure. The shelter we went to only charged us $25 to bring Trooper home. How much your Labrador will cost will often depend on what’s important to you. Should you adopt a puppy, adolescent, or an older Labrador? The answer to this depends on you. How much time and energy do you have to invest in your new Labrador? The younger the dog is the more care he will require from you. Puppies are adorable but they definitely require the most time and energy. Your puppy will need to be taught everything. You will need to potty train him as well as teach him how to socialize with other animals and people. A puppy may need to go to the bathroom about once an hour and even though he may sleep a lot, when he is awake he will need lots of supervision. Labrador puppies tend to chew on everything. We have been learning this first-hand with our new puppy, Scout. She constantly tries to eat everything she finds in the yard as well as chews on every surface in the house. Raising her takes a lot of supervision and correction but she is learning. One nice thing about adopting a puppy is that you will be getting to train him exactly the way you want. You won’t be getting a dog that already has bad habits that you need to retrain. You can ensure that he gets the right food and exercise from the very beginning. In addition to those things, watching them learn is very rewarding. You just need to be sure you have plenty of time to devote to training if you decide to get a puppy. If you don’t think you have the time and energy for a puppy but still want a younger dog then you may want to consider adopting an adolescent Labrador. At six months of age to a year, the Labrador is more developed and many have already had some training. An adolescent dog may already be potty trained and even know some basic commands. At this age, the dog can be left alone longer than a puppy as long as it is kept in a safe area. Most adolescent Labs can adapt fairly easily to a new home as long as they are shown lots of love and affection. If the Lab has come from a neglected or abusive home then it may take a little more time for him to adjust. Patience and love will win him over. Make sure you give him a fresh start with a new name. The old name may just bring up bad associations for him. Adolescent Labs still need lots of exercise. He will need to be walked regularly as well as played with to work off all of his energy. Mental activity is important as well. Finding toys that involve your Lab, like treat dispensing toys, can help to keep him occupied mentally. Make sure your adolescent Lab has plenty of chew toys. He will need to exercise his growing teeth and Labs continue to be strong chewers throughout this phase. If you work full time or just don’t have the time a puppy or adolescent would need then you may want to consider adopting an adult Lab. Most adult Labs have had some basic training and they are usually potty trained. If you are able to spend a little time with them before you bring them home you can get an idea of their personality and temperament. Like the adolescent Lab, it may take him a little time for an adult Labrador to adapt to a new family, but if you show him love and give him lots of attention he will eventually adapt. If he has some bad habits you may want to consider taking him to obedience classes to help retrain him. When we adopted our 6-year-old Labrador the shelter thanked us for choosing him. They told us that many dogs that are 6 years or older are not adopted because of their age. We were surprised to hear that. An adult Lab can be a great companion and he still has many years of love and affection to give. This is another reason to consider adopting an adult. Labs come in three basic colors- black, yellow and chocolate. These are the only colors recognized by the American Kennel Club. There are different variations of these colors, some Labs may be darker or lighter than others, but they all still fall into these three colors. One Lab can have a litter that has more than one color in it. For example, our Lab puppy, Scout, is a Yellow Labrador but her parents and most of her siblings were Chocolate Labs. Over the years different groups of people have tried to attribute different Labrador behavior or temperament to the different colors. However, there really are no major differences that can be attributed to any particular color. Most Labs, no matter what color, are loyal, friendly dogs. Their character is based on their individual personality or how they are raised rather than the color of their fur. We’ve spent many hours of study on this subject of whether a Labrador’s color affects their personality. You can read more about this in my article Does Labrador Color Affect Their Personality. Basically, you just want to pick the color you like best. We have encountered many Labrador owners with dogs of different colors. We have both a Black and Yellow Labrador. It basically comes down to which color dog you like best. The decision of whether to own a male of female Labrador also basically comes down to personal preference. Just as with the issue of color, many people argue over the differences between male and female Labs. Some say males are easier to train, others make the same claim with females. Some assert that males make better workers while females make better pets. Others claim the opposite. Ultimately, it all depends on each Lab’s particular personality and how they are raised. Males are typically a little larger and stronger than the females but both genders are strong active dogs. One of the main differences between the two is that the male dogs often try to mount everything from stuffed animals to your leg. Likewise, female dogs go into heat somewhere between 6 months to a year. This heat season can be quite messy. In both instances, if you choose to have the dog spayed or neutered that usually takes care of the issue. If you plan on breeding your Lab then you will just need to decide which issues you would rather deal with- the mounting or heat. If you already have a dog in the house it is often a good idea to choose one that is the opposite gender from the one you already have. They will often get along better and the gender difference may offset any authority challenges. According to the dictionary, temperament is “a person’s or animal’s nature, especially as it permanently affects their behavior.” One thing to keep in mind is that puppies can inherit their temperament form their parents. If you are purchasing from a breeder ask if you can meet the sire and dam. Watching how they behave may give you an idea of what your puppy’s temperament will be like. You want a dog that is not too shy or skittish and is friendly. Watch how the puppy or dog interacts with you and with other dogs around it. Is it playful? Is it curious? Does it shy away a lot? All of these observations will help you learn the temperament of the dog. There are three basic places to adopt Labradors and we will go over each one. If you want a show dog or a hunting dog then you will definitely want to go through a breeder. There are many ways to find breeders. You can ask for references from friends or you can search online. If you want to make sure you find a breeder with an excellent reputation then you should contact a Labrador club in your area and ask for references. A reputable breeder should have references from previous clients, their kennel should be clean and their puppies should be in excellent health. They should ask you lots of questions to make sure your home will be a good place for a Labrador puppy. A breeder should have all the paperwork on hand to prove the lineage of your new Labrador as well as being able to show you the mother and other littermates. One downside is that once you find a reputable breeder you may have to wait a while for your puppy. They often have waiting lists. Another downside is the cost. Since these puppies have proven show level or hunting lineage they can cost quite a bit. There may be some puppies in the litter that won’t be show quality and the breeder may charge less for them. If you aren’t looking for a show dog or a hunter then you can use someone who just breeds their Labradors to be pets. You still want to make sure they are legitimate and that the kennel is clean and the puppies are in good health. You should also still get to meet the mother and other littermates. If the puppies are purebred, the breeder should have the paperwork on hand to prove it. If you go this route then you probably won’t have to wait as long as the cost can be considerably cheaper. There are shelters and rescue centers that specialize in Labradors. They rescue them from homelessness or abusive homes and put them up for adoption. These centers are usually very careful about the homes they adopt these Labs out to and will ask you lots of questions to make sure your home will be a good place for a new Lab. There are also shelters in most cities that have all sorts of dogs on hand. You may be able to find a Labrador or a Lab mix at one of these. Shelters and rescue centers tend to have fewer puppies and more older dogs so this is a better place to go if you aren’t specifically looking for a puppy. Many of these older dogs already have some training and are often potty trained. When you adopt from a shelter the dog will usually be spayed or neutered and will also be up-to-date on all shots. Because these dogs have been rescued they usually don’t have paperwork proving their lineage. In fact, you may not even know for sure if they are a purebred Lab. If you are mainly looking for w good pet then I feel this is a wonderful way to go. You are giving a precious animal a chance to have a new home. 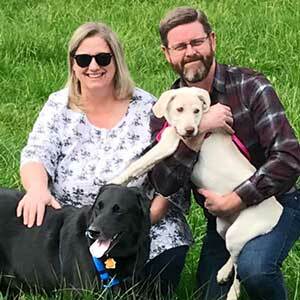 As I mentioned earlier in this article, Labs adopted from shelters as adults may need a little time and patience as they learn that they have a new loving home. However, most adapt fairly quickly. Besides giving a Lab a new home another plus to shelters and rescues is that they are cheaper than breeders or pet stores. Pet stores can be an easy and convenient way to adopt a Labrador. However, there are several things to be careful of when purchasing from a pet store. Make sure they can provide all of the details of the Labrador puppy’s breeding and history. You also want to make sure the puppy has been well cared for. Check for any signs of illness like nasal discharge or watery eyes. Look at the area the puppies have been kept- make sure it’s clean. Once you bring home your new puppy you will want to take it to the vet as soon as possible to check on any health conditions. Puppies in pet stores are often kept in close quarters so if any of them are sick it gets passed around quickly. I have experienced this first-hand as there have been two times in my life where my family purchased a puppy from a pet store and found out it was sick when we got it home. Once with kennel cough and another time with an ear infection. Pet stores can also be quite expensive and often try to sell you extras that you may not actually need. So, just be careful to check everything out. Labradors are wonderful dogs that make very loving and loyal pets. However, as with any pet, you need to be sure that a Lab is the right choice for you. Once that decision is made think carefully about the type of Lab you want. Planning ahead and being prepared is crucial so that the adjustment can go as smoothly as possible.